THE NEW INFERNO IS THE LATEST INNOVATION FROM PINNACLE; IT SEPARATES THE THERMAL COMPONENTOUT OF THE WETSUIT SO IT CAN BE USED IN ANY WATERSPORT ACTIVITY. CAN BE USED AS A WARM WATER SUIT ON ITS OWN, UNDER A WETSUIT TO BOOST PROTECTION OR AS A LAYER UNDER A DRYSUIT FOR EXTREME CONDITIONS. • Constructed using a Tri-laminate material with various thermal linings inside, high stretch Lycra outside and a breathable membrane between adds warmth without buoyancy while under the water and wind resistance above. • New 320 gram merino™ fleece in the chest and traditional merino™ lining in the back and sides to provide unprecedented warmth in the core. • Bi-laminate merino™ lined material under the arms is 100% breathable to prevent overheating when out of the water. • The removeable shoulder closure allows you to attach a V-skin collar, V-skin merino™ hood or 5mm merino™ hood depending on your preferred use. 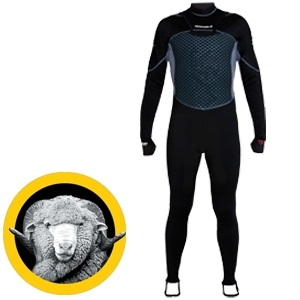 • Technical fleece in the arms and legs allows the warm water created by the core to easily transfer around the suit. • Thumb and heel loops keep suit in place when donning but also allow warm water to circulate through gloves and boots keeping your extremities warm. • Chest overprint improves water runoff and wind resistance in the front. Pinnacle's new V-skin line takes all the technical features that Pinnacle has developed over the years and incorporates them into a layering system that will add significant thermal protection without buoyancy. The V-skin line has taken Pinnacle's patented Merino™ lining to another level by incorporating it into a tri-laminate material with a microporous membrane and high stretch outer lycra. This highly technical combination of materials will form perfectly to the body without causing restriction; the form fit creates the perfect water layer held in place by the impermeable membrane. When out of the water the microporous membrane acts as a barrier eliminating wind chill while allowing excess heat and moisture to escape. With strategically placed highly breathable bi-laminate Merino™ panels the new V-skin line is the most comfortable and thermally efficient product on the market today. V-skin range includes hooded vests, gloves, socks and hoods.